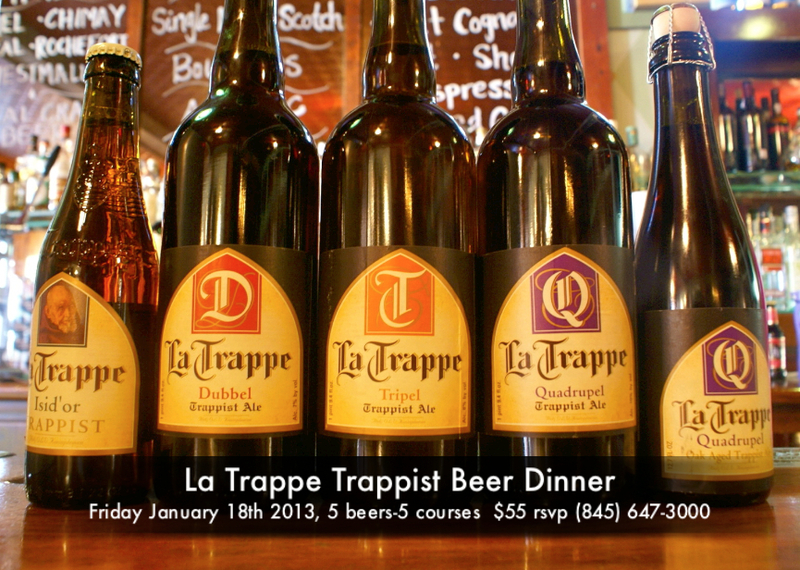 Details: Five course dinner paired with La Trappe Beers. $55 per person, rsvp (845) 647-3000. The first and only Trappist white beer in the world. A fresh thirst quencher with a refined character. Recognizable as a white Trappist beer due to the use of mainly wheat malt. Brewed with very aromatic varieties of hops. La Trappe Witte Trappist is unfiltered. This beer is indeed brewed to commemorate the 125 anniversary of the brewery, AND is named after brother Isidorus, the first brewer of brewery "de Koningshoeven". Filtered, then bottled with yeast and sugar. "Discover this genuine dark Trappist beer with a gentle flavour, creamy head and pronounced bouquet. "A special and strong Trappist ale. The use of coriander gives it a spicy character. Golden in colour with a fruity, bittersweet taste. The strongest of the special beers. Its flavor is full, mild and pleasantly bitter. Quadrupel is presently available in the autumn, is bottled by the year and is perfect company for those long winter evenings.